*One day after their twins were born, Mariah Carey and Nick Cannon renewed their vows with a hospital ceremony conducted by the Rev. Al Sharpton, reports the AP. Saturday was the couple’s third anniversary — and also the day when Carey gave birth to a girl and a boy in Los Angeles. On Sunday, Sharpton blessed the babies, and also presided over a ceremony where the couple renewed their vows. 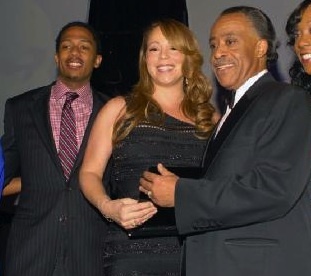 Sharpton tweeted that Carey looked “great” and that the babies are beautiful. No names for the newborns have been announced. WOW! Mariah was feeling up to particiapting in a wedding ceremony one day after giving birth to twins no less. Good for her!! He is a Rev.?? Stop lying. Thought he was just a highly paid Obama boot licker. renewing vows is like revisting the place where you got hit by a car …..to be hit by a car!!! !…jb, he’s still giddy from his acceptance….he only recently came into favor, though I think he’s one of those mail-order preachers, ’cause where is his flock? Mail order huh?? LOL. Funny. Yeah what is weird is that crazy prophet dude that is on BET has a mural with the heads of people that have given him money in his crib. And Carazy Al is one of them!!! You a Christian but support a dude who has a prophet school? What the?